Alright peeps. Grilled Stuffed Chicken Breasts. This is one of those times where the after pictures are sorely missing, um… well…because we were hungry and ate before I could snap more pictures. But, I do have to say that I was really pleased with how gorgeous the before pictures turned out. So, I decided to share a few more of them with you than I normally would. 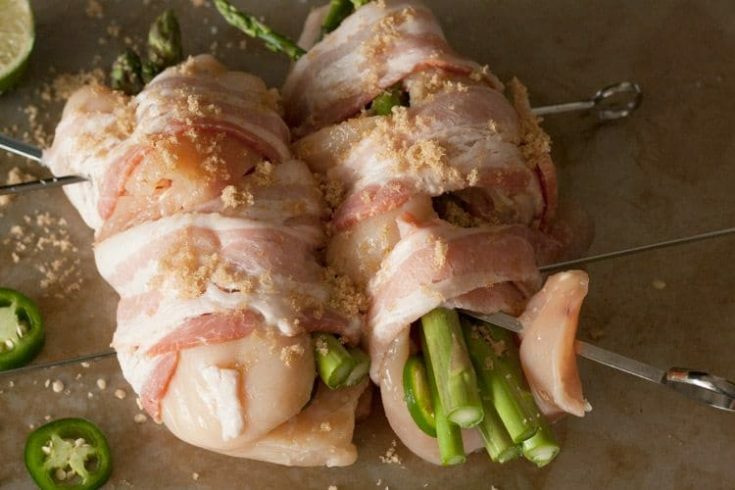 Bacon-Wrapped Stuffed Chicken Breasts – Grilled Chicken that is Wrapped in Bacon and Stuffed! We’ve been grilling A LOT lately. Spicy Rub Pork Chops, Spicy Grilled Chicken Kabobs, veggies–yes, they were spicy too. So, I decided to created another yummilicious grilled chicken recipe using up some of the other ingredients I had sitting around in my fridge, and came up with the delightful concoction you see below. Um yes… that is totally bacon wrapped around stuffed chicken breasts and sprinkled with brown sugar. Just goes to show you can skewer just about anything you want to. Why not, right? We had an amazing 4th of July weekend with friends, culminating in a 5 1/2 hour round trip drive to drop our daughter off at basketball camp. Let me just say, I’m looking forward to this week–even though I miss our daughter–who is having so much fun with her friends. She is probably hardly missing home at all. This week is going to be all about simple meals and getting caught up on editing all of the photos I’ve been busy taking lately. I have a ton of parade photos to go through. Considering we aren’t going anywhere on vacation this summer, I’m glad we’re at least getting out for some day trips and enjoying our state. Wisconsin really has so many truly beautiful places to see. This is a seriously simple recipe that only takes five basic ingredients and a few extra seasonings. Start by splitting chicken breasts down the middle in order to stuff them with other ingredients and to roll mostly closed, squeeze juice from half a lime over chicken and then stuff with jalapeno slices and 4-5 stalks of asparagus. Add salt and pepper for seasoning, wrap with bacon and sprinkle with brown sugar. Grab your barbecue skewers and stick them through bacon and chicken, holding everything together. Toss on the grill, grab a glass of wine and get ready to enjoy a mouth-watering combination of flavors.